Spice up your backyard with a stamped concrete patio! Stamped concrete in Winston-Salem, NC has become recently popular and we know why. Stamped concrete patios feature unique one-of-a-kind designs that are tailored to your personal design preferences and needs. In other words, they provide an open space that feels personal, yet luxurious. Regardless of the size of your patio, the unique design will make your patio feel multidimensional and multifunctional. With a stamped concrete patio, you and your family will be eager to hang out in your backyard! Whether that means getting up early to watch the sunrise with your significant other, relaxing throughout the day, or enjoying a few drinks at night, you won’t want to hang out anywhere else! The open multidimensional aspect of our patios makes it versatile enough to host any gathering or event like barbeques and game nights. Since North Carolina has gorgeous summers, having a stamped concrete patio in Greensboro, NC or anywhere in the Triad is great because you can even host larger scaled events, such as a Fourth of July party or an end-of-summer celebration. Whether you plan on using your patio to relax and catch up with your loved ones, or to host social events, we are one of the most qualified stamped concrete patio contractors in the area. At Outdoor Lifestyles, LLC, we are dedicated to installing a custom outdoor living space that provides a generous amount of elegance and versatility to your backyard that will suit various needs and add overall value to your home. Stamped concrete is a great material option for homeowners because it is one of the most attractive, affordable, and durable materials on the market. While the texture and appearance of stamped concrete appears luxurious and top-notch, the cost to install the material is a lot cheaper than classically appealing materials, such as brick pavers. Stamped concrete is also a lot more durable than traditional material because it’s less likely to crack. 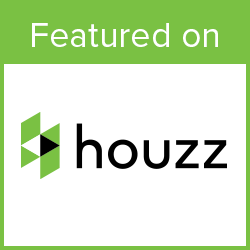 At Outdoor Lifestyles, LLC, we understand that customizability is extremely important. No one wants to have the exact same patio as everyone else. You should be able to tailor your stamped concrete patio to fit your personality, design preferences, and overall needs. That’s why we include you in every step of the process from design to project completion. You will be able to work alongside our main contractor to design the stamped concrete patio of your dreams. Feel free to add some decorative elements, such as a fire pit. A stamped concrete patio with fire pit is a great option in Winston-Salem, because it adds another functional element to your patio that also increases its value. With a fire pit, you won’t have to worry about sitting in darkness or getting cold while you relax on your patio at night. 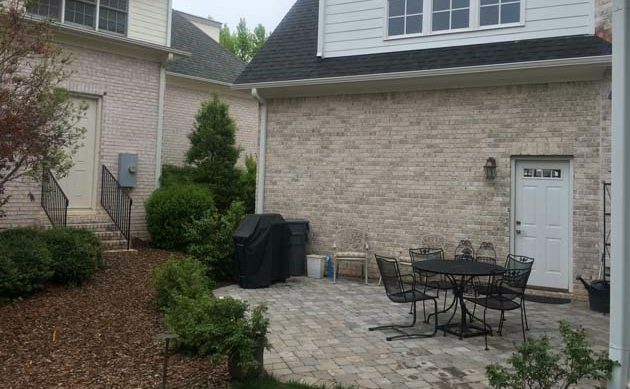 Also, a stamped concrete patio with fire pit gives you more opportunities to bond with loved ones, do more activities, and host more social events throughout the year. Two of our favorite things to do with a fire pit are make smores with family and friends and host a bonfire! A fire pit isn’t the only additional feature you can install in your stamped concrete patio. If you’re a fan of grilling, or just cooking in general, you could always install an outdoor kitchen. Outdoor kitchens are great because you can incorporate everyone into the cooking, and you don’t have to trek inside just to make a meal on a beautiful day. If you feel like additional features are a little too over-the-top for your personality and needs, simply decorate your new patio with some furniture, plants, and lighting to create a welcoming space! As one of the top stamped concrete patio installers in Winston-Salem, we are dedicated to providing quality customer service and products. That’s why we only use quality materials and state-of-the-art techniques. 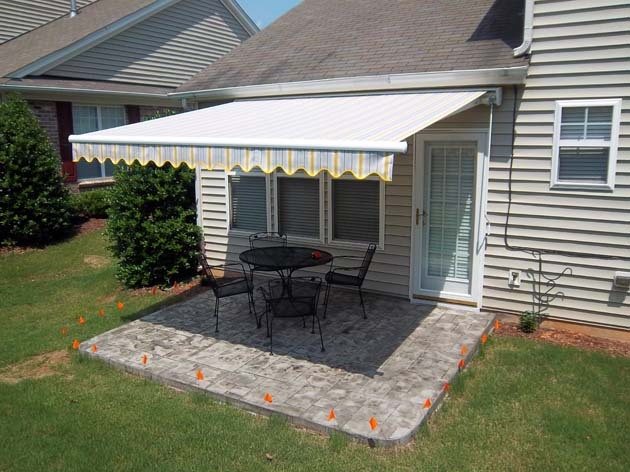 This ensures that your custom outdoor living space will remain strong, durable, and functional for many years to come. Whether you want to revamp your current patio, or completely transform your outdoor living area, we are prepared to tackle any kind of project. Our dedication to luxury service at an affordable price has led us to become one the most reliable concrete contractors in Winston-Salem, NC. Let us help you design your perfect outdoor living space! Give us a call at (336) 221-3916 or click below to request a free consultation, so we can start building the stamped concrete patio of your dreams.